We need Christians whose experience is corrected, elevated, and altered by the Word’s penetrating perfection. The manly stuff is missing from modern day Christianity and this book is aimed at injecting it straight into the bloodstream of the believing life. With typical Eric Ludy candor and passion, this book will ignite your soul with the desire to fight for all that is sacred and all that is true. 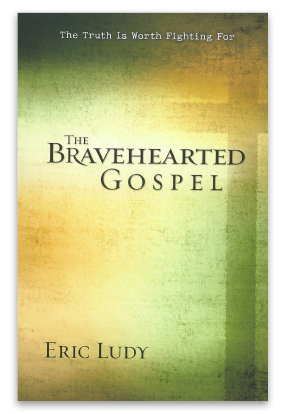 The Bravehearted Gospel is a field manual for everyone interested in upholding the integrity of the Word of God and the moorings of the ancient faith in these confusing times of postmodern emergence. The Bravehearted Gospel expresses the foundation of everything that Leslie and I believe. It’s the ‘deeper message’ behind all that we speak, write, and teach. And it presents an urgent message for the modern church. Leslie and I believe that American Christianity is in crisis. Once upon a time, Christianity was the stuff of legends and its loyalists were spiritual and moral revolutionaries—the kind of men and women who turned the world upside down. But over time, something has happened to that once fervent and bravehearted band who dared to be called Christians. Many today have inherited a faith that has no real life or power. Instead of zeal there is apathy. Instead of courage there is timidity. And instead of confidence there is paralyzing doubt. Something has to change. For all those hungering for a spiritual revolution, there is an ancient blood-stained trail, trod by the greatest men and women in history, beckoning us to once again explore its epic and grand terrain. For all those hungry for a Christianity that actually works, a faith that reforms the human life and possesses the power to rescue this dying world, this trail mustn’t be ignored. For it is the path of heroes and of real-world change—it’s the path of the Bravehearted Gospel. This book can super-charge your spiritual life and awaken you to the power of the Gospel like never before!